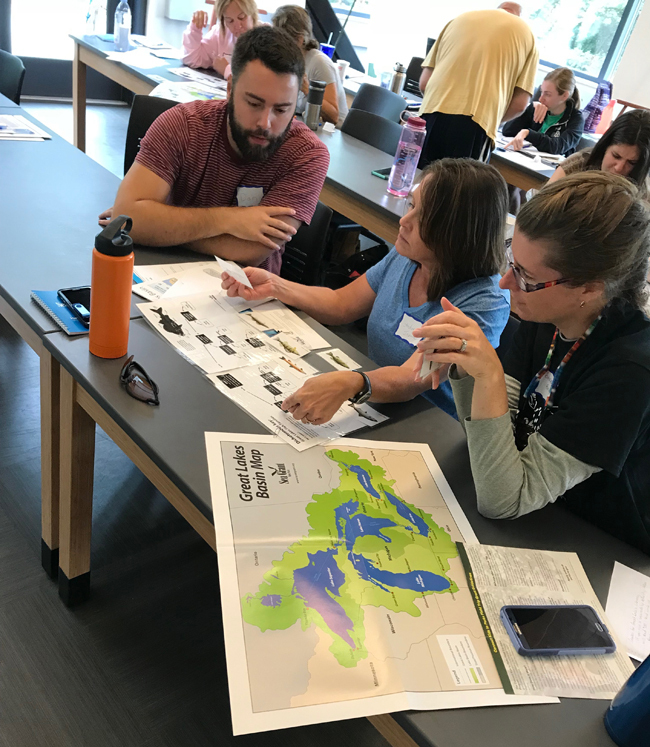 Educators at this summer's A-Z Lake Ontario Workshop examine a Great Lakes basin map produced by New York Sea Grant. The Great Lakes — Superior, Michigan, Huron, Erie and Ontario — contain 20% of the world’s fresh surface water and provide the water necessary for the basin’s agriculture, industry, hydroelectric power and recreational activities like fishing and boating. Credit: All photos courtesy of Brittney Rogers/NYSG. Oswego, NY, August 27, 2018 - Nearly two dozen formal and informal educators were offered a glimpse into the Great Lakes ecosystem, with interactive lessons ranging from A (alewife) to Z (zooplankton). 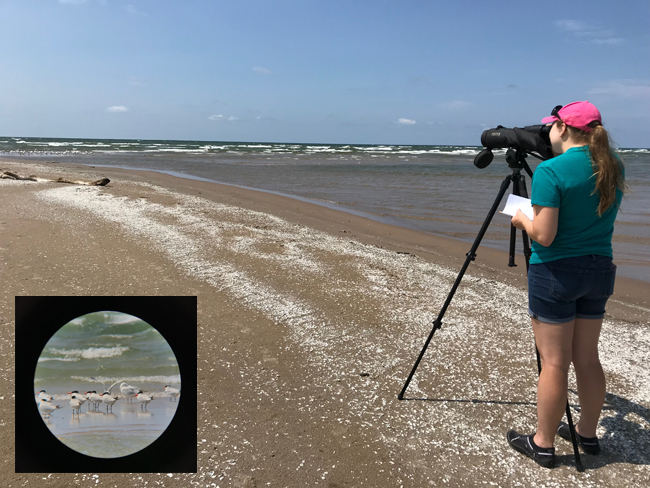 The free two-day workshop, which took place along eastern Lake Ontario's shoreline earlier this month, builds on the same lessons a separate set of some 20 educators in grades 4 through 10 received in July 2017 via the New York Great Lakes Ecosystem Education Exchange (GLEEE) program. 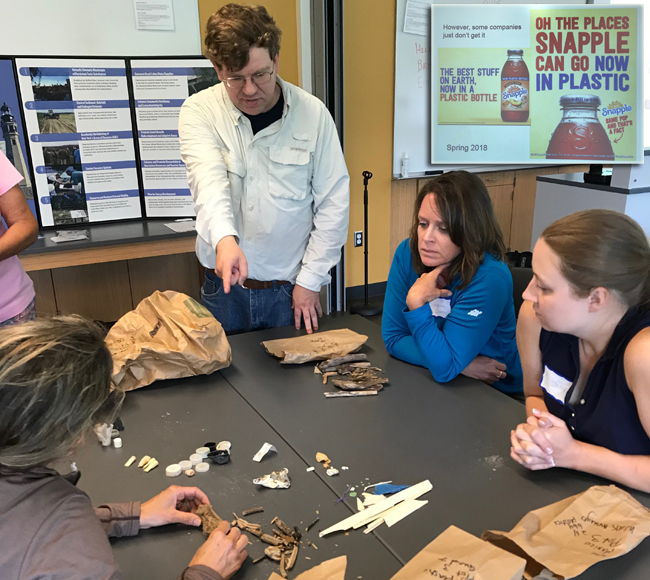 Through GLEEE, a partnership between New York Sea Grant and the New York State Department of Environmental Conservation, teachers are provided with hands-on, experiential learning opportunities focused on Great Lakes Literacy Principles and stewardship. "This workshop was an opportunity for us to work with a new group of teachers, ones in the Central New York region who have not yet been exposed to the program and the basin bin materials we can make available to them," said NYSG's Coastal Education Specialist Helen Domske, who co-led the education excursion with NYSG Extension Aide Brittney Rogers. These Basin Bins, which include over two dozen hands-on resources, can be loaned to educators at no cost upon request for up to a two-week period. To learn more on what's included and where these free resources can be found, visit the "Basin Bins" page on the GLEEE resources site. Below are some photos from and additional information on this year's summer workshop. Also, last summer's inaugural workshop is detailed in "Sea Grant Brings GLEEE to A-Z Summer Education Workshop on Lake Ontario." And for more on the GLEEE program, visit www.nyseagrant.org/gleee. 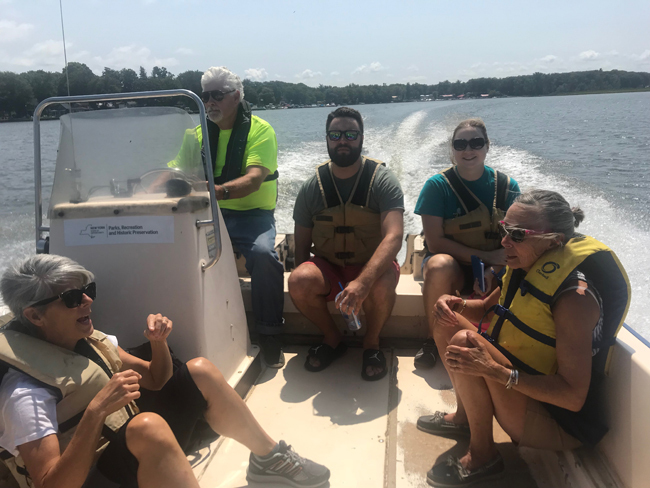 While exploring the eastern Lake Ontario shoreline, the educators learned more about, among other things, habitat restoration and marine debris education, the latter of which is a topic that Domske addresses via a fact sheet (pdf) and through a news archive. For years people have worried about the environmental impacts from plastics left behind in the oceans and Great Lakes. A more recent concern are the plastic particles that result from the breakdown of larger plastic items, such as bottles. These small plastic spheres are known as microbeads. The dunes of the Eastern Lake Ontario Dune and Wetlands Area, which serve as the only significant freshwater dune site in the northeastern U.S., were formed by wind and wave motion of a giant inland seas that preceded Lake Ontario. This 17 mile stretch — portions of which are seasonally accessible only by boat or kayak — extends from the Town of Richland in Oswego County north along Lake Ontario to Jefferson County. 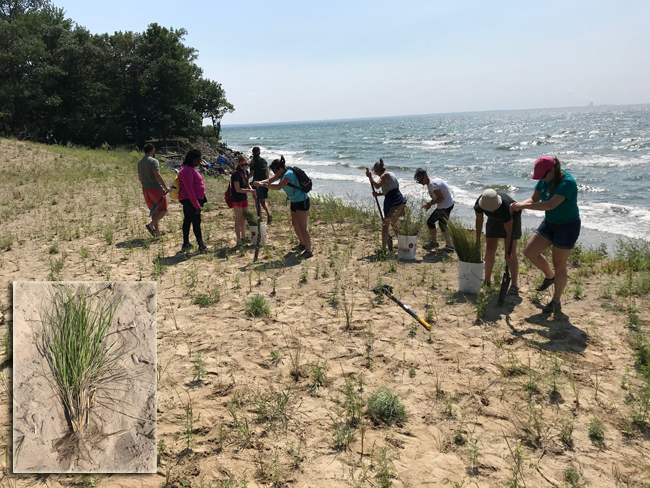 Educators planted native Champlain beachgrass (seen in inset) along the lakeshore in hopes that it will help build up some protective dunes. Located in Altmar, NY, the Salmon River Fish Hatchery serves an 11-county area and supplies fish for more than 100 public waters including Lake Ontario. Each year, the hatchery stocks approximately 3.5 million trout and salmon, including key sportfishing species such as Chinook, coho and steelhead. 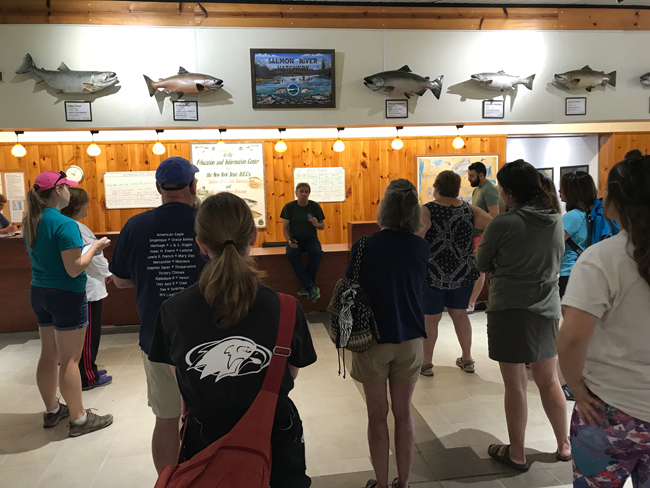 “The hatchery opened in 1981 and, at the time, was the most modern of its kind in all of North America for raising Pacific salmon,” said Salmon River Program Coordinator Fran Verdoliva (pictured in center, leading a discussion withe the educators). A renovation of much of the hatchery's space shown on public tours was recently completed. Eastern Lake Ontario's wetlands, woodlands, creeks, ponds and sand dunes provide a unique habitat to several species of migratory birds and waterfowl, including sandpipers, plovers, killdeer, gulls and terns.